I have not made Chicken Marsala in years. I'm sure the last time I made it, it was not gluten or dairy free. But really, this recipe is very easy to adapt. I used the recipe on the back of the Marsala Wine bottle (which says gluten free right on it!). The pic is a little fuzzy because it was steaming hot and fogged up my camera lens! But it was so tasty. On the side I just steamed some spinach and drizzled it with olive oil. Delicious!! Adapted from the recipe on the Holland House bottle. In large skillet, melt butter and saute mushrooms over medium heat until brown - approx ten minutes. Add chicken to skillet and cook through, 4 minutes each side. Return mushrooms to the pan, stir in Marsala, water, parsley and rosemary. Heat and pour over chicken. Serves four. I like my Marsala sauce thick so I cooked it down quite a bit, but it's up to you how long you cook the sauce at the end. I also did not add parsley or rosemary. It was just fine without them. 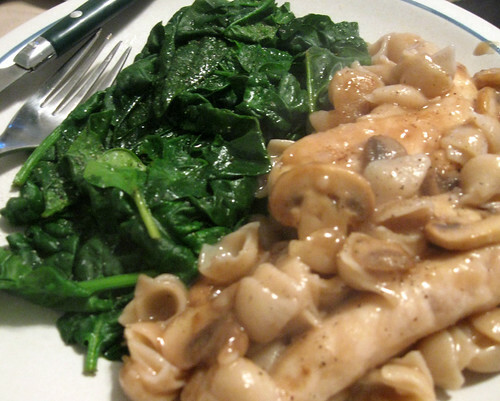 I prefer to serve my Chicken Marsala over pasta, so I cooked Tinkyada brown rice pasta shells and mixed them in at the end. Enjoy! !